What is basil herb (Ocimum basilicum)? Basil or sweet basil is a popular culinary herb botanically known as Ocimum basilicum of the family Lamiaceae (mint). Basil is an annual plant, which is originally from Asia before spreading to other parts of the world. Basil is a Greek word βασιλεύς (basileus), which literally means king. Basil, which is highly rich in phyto-nutrients is a popular culinary flavor that gives distinguished taste to food. Basil is greenish in color with a pointed round leaves in appearance. 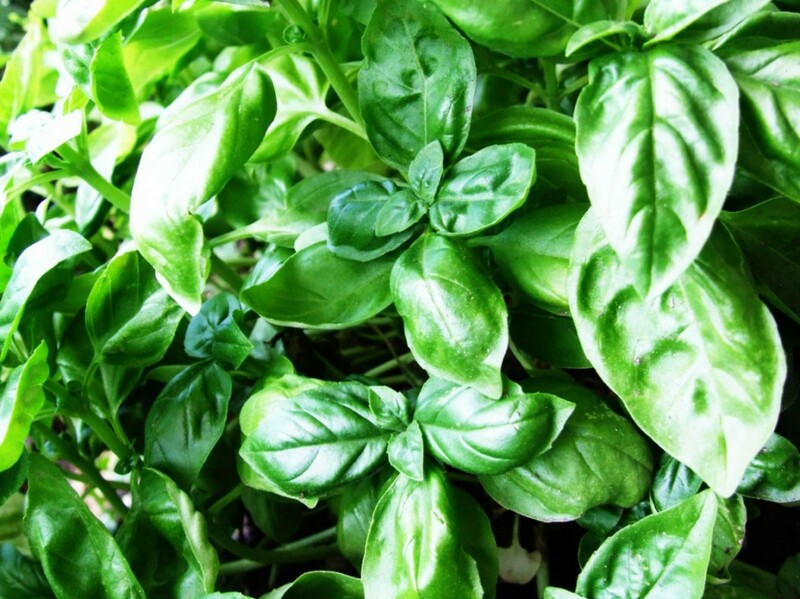 Sometimes referred to as Saint Joseph's Wort, basil has a varying taste ranging from sweet, pungent or strong. This leaf is sought out by many people due to its numerous benefits to human health. There are several species of Ocimum basilicum such as; Holy basil (Ocimum tenuiflorum), Rubin basil (Ocimum basilicum), Lettuce leaf basil (Ocimum basilicum), Lemon basil (Ocimum americanum), African blue basil (Ocimum kilimandscharicum), Cinnamon basil (Ocimum basilicum), Spice basil (Ocimum americanum) and Anise basil or Persian basil (Licorice basil). African blue basil is characterised by a strong camphor smell, which is as a result of camphor and camphene scent in it. Sweet basil has a unique clove scent, which comes from eugenol while the lemon basil has a stong citrus scent that comes from limonene and aldehyde citral. 1. Researchers reveal that basil contains varieties of essential oils that are rich in polyphenolic and phenolic compounds such as flavonoids and anthocyanins. 2. Basil leaves possess strong antiviral, antimicrobial and antioxidant properties in them due to the presence of compounds such as ethanol, vicenin and orientin in them. 3. Basil is used for treating stomach disorders such as intestinal gas, stomach spasms and loss of appetite. 4. Basil Ocimum sanctum is used in ayurvedic medicine as a remedy for headaches, cough and common colds. 5. Basil is anti-bacterial in nature thus acts as an insect repellents. 6. Basil is anti-inflammatory in nature due to the presence of eugenol, limonene and citronellol in the leaf. 7. When raw basil is squeezed and applied on the body part bitten by venomous animals, the chemical content of the leaf is capable of extracting the poisonous venom from the body. 8. Basil seeds can be used to control blood sugar level sugar hence thay are a great remedy for diabetes. 9. Regular intake of basil drink is helpful in cutting down excess weight. 10. Decoction of basil seeds can be used for treating urinary infections. 11. Researchers reveal that using basil before and after childbirth by women helps the breast milk to flow as well as promotes blood circulation. 12. When used as a mouth wash or gargle, basil water is capable of killing harmful bacterias in the mouth. 13. The presence of key chemical compounds in basil helps to get rid of intestinal worms. 14. Basil is an excellent source of calcium,magnesium, iron, Vitamin A, magnesium,copper, beta-carotene, potassium and manganese. 15. The presence of beta-caryophyllene in basil makes them ideal for treating inflammatory bowel diseases and arthritis. 16. Basil leaf contains anti-aging properties that is capable of preventing aging harmful effects. 1. Bozin B., Mimica-Dukic N., Simin N. and Anackov G. (2006), Characterization of the volatile composition of essential oils of some lamiaceae spices and the antimicrobial and antioxidant activities of the entire oils, Journal of Agric. Food Chem. 54 (5), pp.1822–4. 2. Fandohan P., Gnonlonfin B., Laleye A., Gbenou J. D., Darboux R. and Moudachirou M. (2008), Toxicity and gastric tolerance of essential oils from Cymbopogon citratus, Ocimum gratissimum and Ocimum basilicum in Wistar rats, Food and Chemical Toxicology 46 (7), pp.2493–2495. 3. Tilebeni H. G. (2011), Review to Basil Medicinal Plant, International Journal of Agronomy and Plant Production. Vol., 2(1), pp.5-7. 4. Wick R. L. and Brazee N.J (2009), First Report of Downy Mildew Caused by a Peronospora Species on Sweet Basil (Ocimum basilicum) in Massachusetts, Plant Disease 93, p.318.